Situated between the Vulkaneifel region and the river Moselle, 40 kilometres from the famous Nürburgring and ideal as a place to stay to enjoy this beautiful region. A choice of en-suite rooms, accommodating up to 30, most with balconies for excellent views. After breakfast, your tour starts outside our door, with splendid routes to the towns of Cochem, Koblenz and Trier, into Luxemburg, touring the Eifel and Hunsrück regions and just nine kilometres from Bad Bertrich, where you will find several restaurants and pubs, as well as a famous thermal spa. Faby and Adrie, with a passion for riding their motorcycles, welcome you to their Genuine Biker Friendly Accommodation. After a day’s ride, return to enjoy a delicious German draught beer on the terrace, a well tasting Mosel wine in the cosy bar and dine in the restaurant or head into the village. Free Wi-Fi. Breakdown and small repair facilities. Drying room and Motorcycle washing facilities. Garaged, private and secure parking. 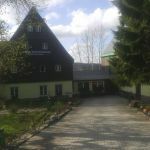 A biker friendly hotel in the Black Forest, that offers you the comfort and luxury of this modern age and the atmosphere and the hospitality of the days gone by. The resident chef, Barbra, has a long experience with different styles and ways of cooking. Serving traditional regional specialties, along with international dishes. During the summer there are a choice of homemade hamburgers and pizza’s and every friday it is BBQ time! The beautiful sunny terrace next to the river Enz offers the perfect opportunity to enjoy a drink and a bite after a day spent exploring the overwhelming nature and roads of the Black Forest. Free Wi-Fi. Drying room and Motorcycle washing facilities. Garaged and private parking. A newly renovated traditional pension style hotel, located in the picturesque landscapes of the Ore Mountain region - an idyllic location for holidays during all seasons. Various rooms such as doubles and singles, Bungalow with Garden View and a Two-Bedroom Apartment - they have 70 beds! 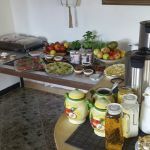 Start your day with a Continental breakfast and the restaurant serves delicious food for Brunch, Lunch, Dinner, High tea, with a Cocktail hour. On-site bar, garden and terrace. Take advantage of the sauna and wellness center, play darts, table football, billiard and/or go horse riding. Situated in the town of Kurort Altenberg, close to Manufactory Glashutte Original, Sommerrodelbahn Altenberg bob slide, Altenburg mining museum and within a short ride to Kuckuckstein Castle, Königstein Fortress and the city of Dresden, on the banks of the Elbe River, rich with cultural and artistic history. The Czech Republic border is just 3 (ish) miles away. Also in an ideal location for various activities such as skiing, cycling, hiking or just relaxing. Welcoming Bikers from around the world! Speaking German and English at the reception and staff are always on hand to help. Free Wi-Fi. Private parking. 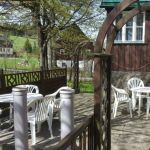 Situated in the Westerwald region, in the village of Pirzenthal, just outside the town of Wissen at the meeting point of two valleys, surrounded by breathtaking scenery. A fully renovated 17th century Tudour house, incorporating many of the fine old features of the original farmhouse and is resplendent with many beamed walls and ceilings, en-suite rooms, beautiful gardens, bbq area, sun terrace, lounge and a well stocked bar! 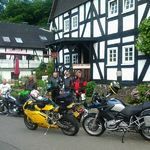 An ideal base for the biker, with many fantastic roads and places to experience, including Sieg, Nister, Rhine and Moselle Valleys, the beautiful old world town of Hachenburg, Nürburgring race track, Dams made famous by the Dambusters raid, the city of Cologne and much, much more, all within a 60 mile radius. Owner Bob, originally from Warwickshire has been welcoming Bikers to Vine Cottage for many years. A previous guest said "Excellent accommodation, in a lovely setting. Bob even took us into Koln to get a new tyre fitted". See more reviews on tripadvisor. Free Wi-Fi. Motorcycle washing facilities, drying room and secure parking. Biker Friendly Accommodation, Motorcycle Friendly, Hotels, B&B, guest houses, camping. Ideal for touring! Germany, Menzenschwand, Hollenstedt, E22 Germany, off the main E22, a short distance from Hamburg and less than 2 hours to Hannover, Bremen, Denmark and the Netherlands, between Hamburg and Bremen, Located just off the main E22, a short distance from Hamburg and less than 2 hours to Hannover, Bremen, Denmark and the Netherlands. places in germany where Bikers are welcome, Manderscheid in the Eifel National park, complete with two medieval castles, just 6 km's from the A1 Autobahn and ideal for a break in your journey or for a longer stay to experience the fantastic roads of the Eifel area. Close to the Mosel and Rhine rivers, the famous Nürburgring and Spa Francochamps is 100km's away. Markgräflerland. to the Ballrechten-Dottingen region, neighbouring Black Forest and nearby French region of Alsace, the winding country roads of neighbouring Switzerland and the nearby Lake Constance region.